There are rare words that can sufficiently describe the moment when a mother first lays eyes on her newborn child. A flood of emotions pours out, from relief and joy, to hope and vulnerability. As a parent, you hope that you will be able to pass on to your child the best parts of yourself, the inner-strengths that they will need as they grow up to face the world on their own. For most of us, our children will go on to live normal lives and we will never know the full extent of how well we were able to pass on those threads of audacity that define a person’s character. For some, like January’s Survivor of the Month, Emmie Lindsey, the courage living inside becomes not just an example to admire, but a rather critical part of the story of survival. Twenty-five years ago, Emmie was diagnosed with breast cancer. She did not know at the time, but the battle that she waged, and the dignity with which she fought it, would be critical not only to her own fate, but also to that of two others very close to her. 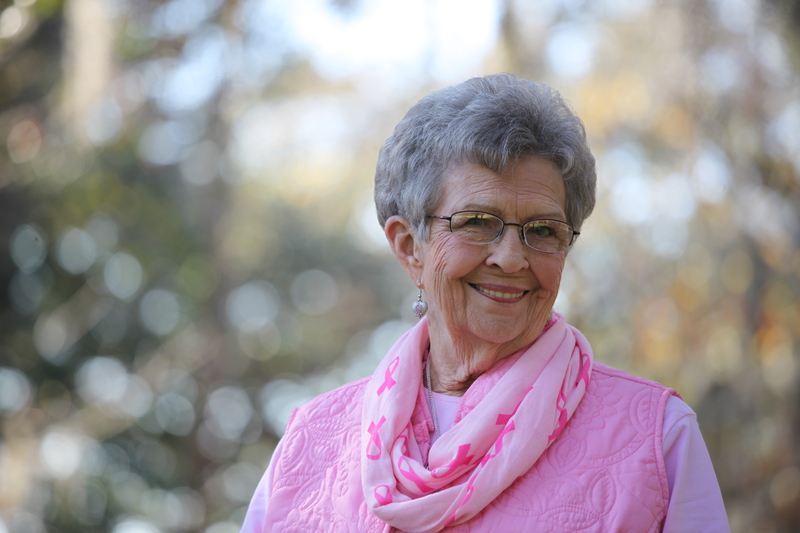 Emmie’s life before breast cancer was full of familiar activities, like working full time in the school cafeteria system, cooking and baking at home, and spending time with family. All of that would change when she went in for her annual screening and received the devastating news that she had breast cancer. “I went for my routine mammogram and was told I needed a biopsy. After the biopsy, surgery was scheduled and I had a mastectomy. I was referred to oncology and was scheduled for 6 months of chemotherapy. I worked in the morning and had treatment in the afternoon.” At the time, Emmie did not have a family history of breast cancer, a fact that underlines the importance of regular exams for all women regardless if there is a prior hereditary reason for concern. Emmie’s story is in many ways an example of the change in times and culture, specifically when it comes to breast cancer awareness and advocacy. “In 1989, it was common not to discuss a breast cancer diagnosis openly. Discussion was limited to family and close friends but my family felt it (was) important to talk to as many people as possible to make them aware of the importance of a yearly mammogram.” Living in a world today full of pink ribbons, awareness commercials on television, and prominent displays of support from the most famous members of our society, it can be easy to overlook the fact that it was not that long ago that simply speaking about breast cancer in a frank, open way took its own act of courage. To this day, spreading awareness remains one of the critical theaters in the war against this terrible disease. Emmie’s ability to be a source of positive inspiration would be critical to her own victory against breast cancer, but would also be central years later when she would learn that two of her daughters, Cindy and Harriett, would be forced to fight against the disease. There are many ways that a mother can have an impact on her children, living a life of courage and hopefulness can sometimes be the most important. For both Cindy and Harriett, having seen their mother endure the hardships of the disease only to persevere with the calling to inspire others was a source of strength that helped them on their journeys.